Every year, thousands of local high school students begin their higher education journey at Cuyahoga Community College (Tri-C®) through Ohio’s College Credit Plus program. Tri-C’s newsroom will share success stories from the program throughout the week of March 12-16. 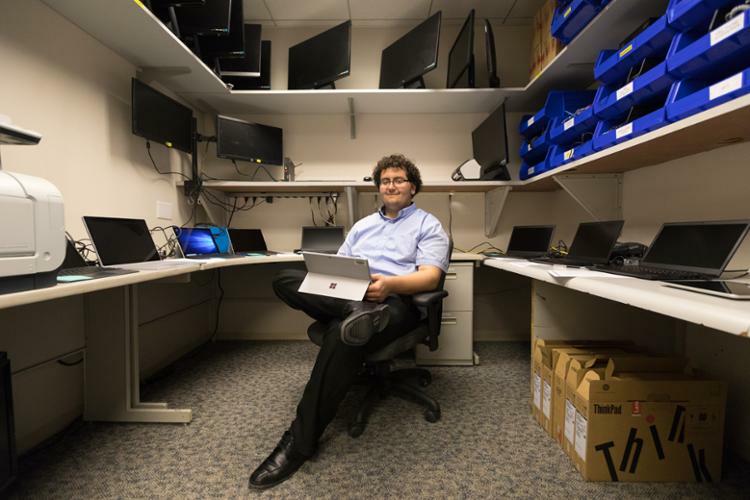 Nathan Cabot clocked in at Benesch — one of Cleveland largest law firms — before 7:30 a.m. most days this past winter as part of an internship in the office’s information technology department. That’s more than an hour before his classmates at Cleveland’s MC2STEM High School hit their desks for lessons. The 17-year-old landed the internship on the strength of his College Credit Plus experience at Tri-C, where he is studying electrical engineering and working toward professional certifications in computer network hardware. “I wouldn’t be where I am right now without College Credit Plus and Tri-C,” he said. Cabot enrolled in his first classes at Tri-C in fall 2016. He eased in at first, taking three classes to see if he could handle the rigor of college coursework. The teen ended the semester with two A’s on his transcript. He loaded his schedule with 17 credit hours in spring 2017 and 16 credit hours this past fall. Cabot attended during summer session, too. He took his classes at Metropolitan Campus, the closest to his home in Cleveland’s Old Brooklyn neighborhood. Cabot is on track to earn an Associate of Applied Science in Electrical Engineering Technology by the end of the year. He will also work toward a professional credential as a Cisco Certified Network Associate. He intends to seek a full-time job after graduation before possibly pursuing a bachelor’s degree. This week's series of College Credit Plus profiles also include success stories on students Kristen Septaric, Nigel Becker and Jennifer Watley.